Chop the stem off the chile. Using a knife, make a single slit down the length of the chile. Coat each chile with a little vegetable oil. Open the chile and remove the seeds. Turn the chile skin side up and with a paring knife, scrape away the skin. Sometimes it just pulls right off, sometimes you really have to scrape it. Do not rinse the roasted chiles. Grill the tomatillos along with the chiles until soft. Drain the juices of the grilled tomatillo along with the tomatillo into a blender or food processor. Cool and then puree. Place the pured tomatillos in a saucepan along with the vegetable stock, chopped green chiles, a pinch of roasted cumin, salt and pepper. Add the cornstarch/water mixture and stir well. Simmer, stirring occasionally, until the sauce is thickened and reduced another 10-15 minutes. Heat oil in a pan. Add minced garlic and onion. Fry until transparent. Add the beans, zucchini, corn, and tomatoes. Add the salt, pepper, hot sauce, and oregano. Blend well. Reduce heat, cover and cook for around 10 minutes. Put a ball of dough between two sheets of plastic. If you don’t have a tortilla press, press to a 5-6” circle using a heavy frying pan or bread board or other heavy, flat object. Put the tortilla into the cooler pan or cooler end of the griddle. The tortilla will probably stick, but within 15 seconds, if the temperature is correct, it will release. Flip it at that point onto the hotter skillet/griddle section. In 30-45 seconds, it should be dotted with brown underneath. Flip it over, still on the hot surface and brown another 30 seconds or so. A good tortilla will balloon up at this point. Remove from heat and let them rest while cooking the remaining tortillas. Use quickly. Heat and oven to 300F. In a baking dish ladle a thin layer of sauce. Lay two tortillas in the dish and ladle another 1/4 cup of the chile sauce over the tortillas. 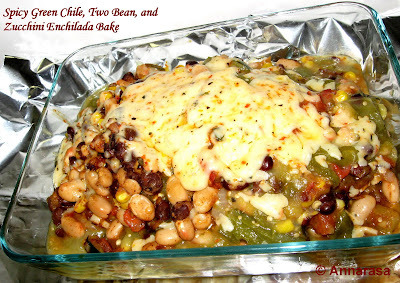 Spoon 1/3 of the bean-zucchini mix, sprinkle with a little cheese, and a ladle of green chile sauce again. Place two fresh tortillas, repeat with sauce, filling mix, cheese, and sauce in that order. Repeat once again. Bake until the sauce has thickened and the cheese melted, about 10-12 minutes. Remove the bake from the oven and rest for 2-4 minutes. Serve individual sized portions. Spoon any leftover sauce over the stacks and sprinkle with cilantro, if you wish. The stacks may also be cooked in individual gratin dishes. 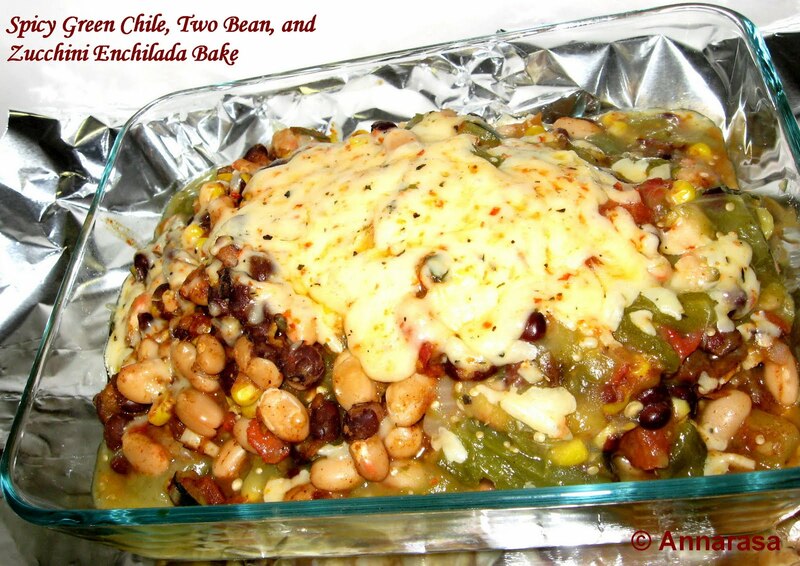 Post Script: Our hosts this month, Barbara of Barbara Bakes and Bunnee of Anna+Food have chosen a delicious Stacked Green Chile & Grilled Chicken Enchilada recipe in celebration of Cinco de Mayo! The recipe, featuring a homemade enchilada sauce was found on www.finecooking.com and written by Robb Walsh. Vegan Substitute: Try a non-dairy tofu/soy melting cheese as a substitute for the cheese in this recipe. That does look so delicious and using a veggie filling so is tasty (I love beans) well done on this challenge and I love how you did a 'lasagna' style I think this is best really. Cheers from Audax in Sydney Australia. 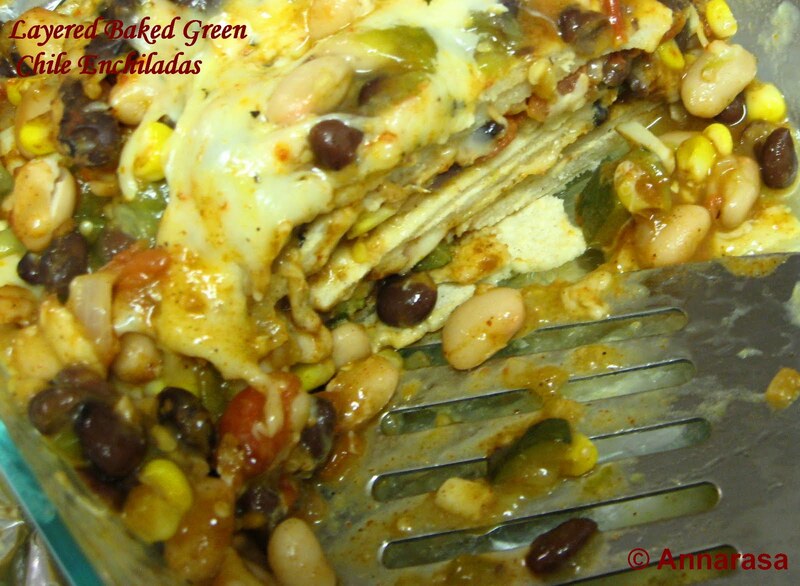 Spicy and so nutritious with Beans and all. I would love it for Sunday lunch. Looks delish. omg, wat a fabulous and wholesome dish, truly tempting..
Looks delish and healthy! And easy for a weeknight dinner - great take on this recipe. yummm!! !looks delish...anything mexican for me!! Love the filling. Yummy!!! Looks very simple recipe. Love to try it sometime..
Apu, this looks amazing dear. Wow, I would love to eat it. looks yummy , healthy too!! Interesting combination of flavors, looks inviting! Wow, that looks super delicious, the pictures are making me very hungry..
What a fantastic vegetarian version, love the filling combinations. It's definitely time to try a green chile sauce. Thanks for sharing this recipe! This looks great and surely tastes good too. Looks mouth watering! wonderful recipe..nice clicks..thanks for sharing!! Makes me hungry now! Very nice recipe!